TOKYO - The Japan Times, an English-language newspaper that amended its description of comfort women and wartime forced laborers last year, apologized to its staff last month, but threatened legal action against anyone found leaking confidential information. In a five-sentence note published last November, the paper said it would refer to Korean laborers simply as wartime laborers and would describe comfort women as women who worked in wartime brothels, including those who did so against their will. The move polarized readers. Some saw it as an effort to whitewash Japans wartime history, while others celebrated the move as a way to correct foreign misinterpretations. In an email sent to the papers staff on Feb 28, Japan Times president Takeharu Tsutsumi apologized for causing turmoil. A Japan Times source shared the email with Reuters; it was verified by several other employees at the paper. The president explained that the purpose of the style change was to enable us to report controversial issues in a fair and neutral manner, and denied that the paper had shifted its political views. Some European and American media have accused us with the narrative that The Japan Times editorial direction moved to the right following the change in ownership. Based on groundless speculation, this is inaccurate, he wrote, adding that on the other hand Japans right-wingers seem to have welcomed this change, but by no means did we intend to reflect any right-wing views. Reuters called and emailed Tsutsumi for comment about the internal email. In response, a public relations representative for the Japan Times wrote in an email that it would not respond to queries about internal documents. In January, Reuters published a story based on interviews with nearly a dozen sources at the Japan Times, as well as hundreds of pages of internal emails and presentation materials, that showed the revision was partly made to ease criticism that the publication was anti-Japanese and increase advertising revenue from Japanese corporations and institutions. 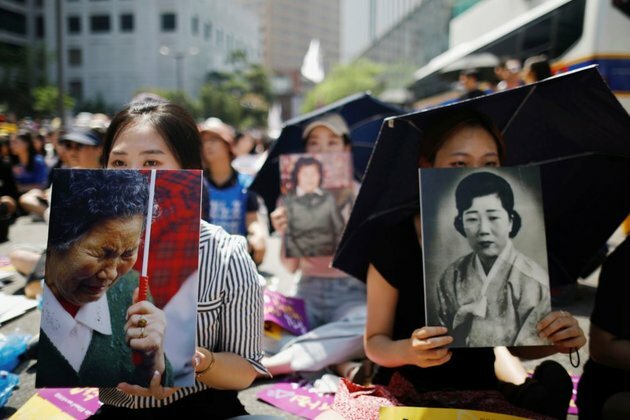 The issue of comfort women and Koreans forced to work in wartime factories and coal mines remains incendiary more than seven decades after the war. Despite the backlash, Tsutsumi told staff there was no significant impact on the number of subscribers. In his email to staff last month, Tsutsumi also called the Reuters story regrettable and said it coupled speculations with information taken out of context to promote a certain narrative. According to the Reuters article, the companys confidential materials and remarks made at the All Company Meeting appear to have been leaked, he wrote, saying it was regrettable if any information had been divulged by employees. The act of leaking confidential information and the act of damaging the companys reputation constitutes a violation of compliance, he wrote. If we learn the identity of the parties who leaked confidential information, we would have no other choice but to penalize them. Some of the papers staff have criticized the recent changes. In an open letter published online last month ahead of the presidents email, Tozen, a labor union representing mostly foreign workers in several industries across Japan, and its Japan Times chapter demanded a full retraction of the style changes. The papers local union, which has 15 members, has been in collective bargaining meetings with management over the issue. Members of the Japan Times chapter declined to comment on the contents of the recent all company e-mail. Both changes were pushed through with total disregard for the input of knowledgeable writers and editors, with zero advance notice, and the changes also show a disturbing disregard for the mainstream historical record, the papers union members wrote in the letter.